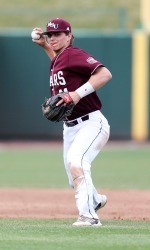 Missouri State rallied from an early three-run deficit to post its fifth-consecutive come-from-behind win with a 5-4 decision over Minnesota Friday evening, running the Bears’ win streak to 10 games. The Bears (19-2), who recorded three straight comebacks in their sweep of fellow Big Ten Conference foe Iowa last weekend, continued their best-ever start to a season by once again erasing an early deficit, this time coming all the way back from a 3-0 Minnesota advantage. MSU secured its 12th comeback victory in just 21 total games this season with matching two-run rallies in the fourth and fifth frames, before scoring the game-winner with a two-out tally in the sixth. After drawing a two-out walk, Matt Fultz sprinted home with the go-ahead run on a Minnesota throwing error, after back-to-back singles by MSU freshmen Jeremy Eierman and Hunter Steinmetz kept the rally alive. The Bears’ bullpen took care of the rest, as Sam Perez (4-0) tossed 2 2/3 scoreless innings, before All-America closer Bryan Young finished off MSU’s 11th home win in 12 contests by working a perfect ninth for his seventh save of the season. Minnesota (10-9) seized control of the contest early, scoring on a two-out triple in the second and adding a pair of runs the following inning. Austin Athmann lined a Jordan Knutson offering into right to lead off the second, before Connor Schaefbauer’s liner got by a diving Steinmetz in center to chase the runner all the way home from first. The Gophers got another leadoff hit to begin the third, this time courtesy of a an infield single by Jordan Smith. Back-to-back one-out doubles by Terrin Vavra and Matt Fiedler produced runs to stretch the visitors’ lead to three runs. The Bears put their first three batters aboard to start the home half of the fourth, setting up a key two-run double by Blake Graham that sliced the deficit to 3-2. Spencer Johnson started the rally with a base hit to left-center, marking the 36th consecutive game the senior outfielder has reached base safely via a hit, walk or hit-by-pitch. Jake Burger then drew a walk, and Justin Paulsen bounced a single through the right side to load the bases. Graham plugged the gap in right-center, driving home both Johnson and Burger before Paulsen was cut down at the plate. MSU struck for two more tallies in the fifth to claim its first lead of the night, using four consecutive singles, including two more from the rookie duo of Eierman and Steinmetz, to set the wheels in motion. Johnson plated the tying run with an infield chopper to third that allowed Eierman to score, and Burger’s laser-shot to left brought in Steinmetz with the go-ahead run. The Gophers answered in the top of the sixth, cashing in on hits from Schaefbauer and Riley Smith to even the score on Dan Motl’s grounder to third. But Fultz was able to coax what appeared to be a harmless two-out free pass from U of M reliever Lucas Gilbreath (0-1), and Eierman lined his second hit of the night to left to give the inning new life. Steinmetz’s dribbler up the third base line resulted in a hit, and Fultz scored easily when Gilbreath’s throw to first was wide of the bag. Perez, who took over for Knutson with the bases full and one out in the sixth, retired eight of the nine batters he faced, striking out four and allowing only a one-out single to Schaefbauer in the eighth. Young closed the door for good in the ninth, rolling a pair of ground balls before getting Fiedler to fly out to right for the final out. Schaefbauer led the Gophers with a 3-for-4 night, and Brian Glowicki provided 2.1 innings of shutout relief. In addition to two-hit games from Eierman and Steinmetz, Johnson went 2-for-4 with an RBI and a run scored for MSU. The Bears and Golden Gophers conclude their series Saturday with a 2:05 p.m. doubleheader.